Niall takes title!!! He was hotly pursued by last year’s winner Garth Weinberg…from NZ. I think Niall surprised himself. How casual he was about picking up a singlespeed conversion kit the day we left town, hours before the “race”, and installing it MORNING OF (race was at three in afternoon)…wow. The course was pretty easy, not technical, except maybe those built bits …9 miles per lap, roughly. I was happy to do a single lap and have beer and root for people (and got to see 26 yr old Niall come across line jubiliantly mud-flecked… He’s a scholar (mechanical engineering) as well as an athlete. Ireland got her own champ without a big fat coprolite, er, corporate logo on his chest. 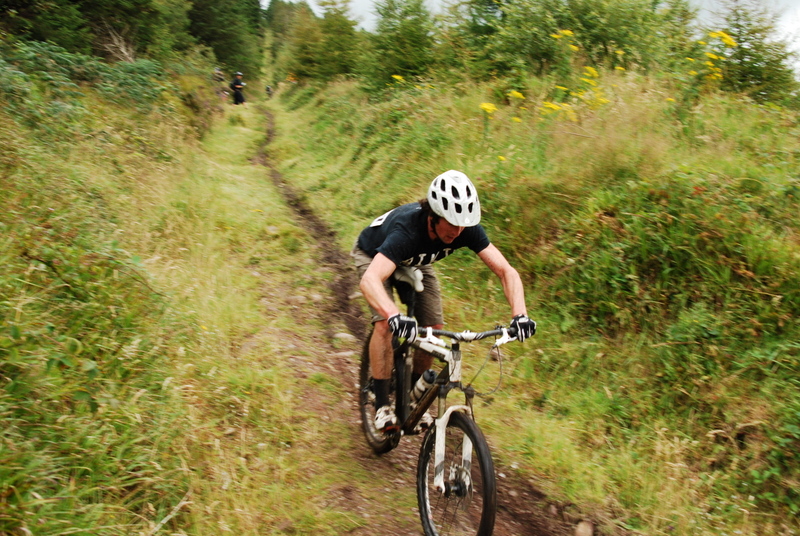 Second place was about half a second back….the kiwi racer (wearing pro kit)who won last year almost stole the win since the finish line was a few chicanes and I actually stopped the wrong place myself. I know there are riders like Marla Streb with a pair of tatts, but it’s nice the local kid took it. Third guy across the line was from Germany I think, and he was very bummed that his chain failed several times, but his wild front wheel (nose wheelie) skid, rear wheel in the air, was most satisfying. Maybe someone caught it. The start, let me tell ya, was a grand parade….Badgers, six of them, Dorothy and her friend the tin man, the Improved Captain America, a rainbow unicorn, several bottles of beer, tutu’d men and women, lots of feather boas, masks and beer helmets. Only one Book of Kells….The pace among my cohort was dignified, efficient, and I almost felt naughty squeaking past the occasional hesitant guy bobbling over the rocky section. There were a half dozen custom designed wooden xylophone sections with swoops and turns, all over what looked like mossy bog, but was in fact lots and lots of fallen trees covered lightly with moss….not something to fall into and impale one’s self on. I was able to (slowly) navigate them all–never touching the brake–but very happy to be done with them since falling 2 feet off a narrow ‘North Shore’ style track can really do a number on your tibia, fibula, femur, shoulder, gee, anything. There were people who fell and were only barely bruised. My friend C. was not one of them. She tipped, and wounded her shoulder enough to look pretty pale at race finish. Meanwhile all around, serious party mode: beer poured (the paper chits we were issued proved to be worthless for most of the night) and stories regaled. Rain didn’t come until around 5 pm, and the only way it was obvious to me (inside big tent) was how suddenly crowded it became…. ~ by jacquiephelan on August 28, 2011.